Microsoft Garage have released a new app which helps users in typing message or emails using their Voice instead of fingers. The app called as “Dictate” lets users type an email or message by using their Voice. The app helps users in making less mistakes since generally while typing you might end up making typo errors and send the messages or emails without having a chance to rectify. 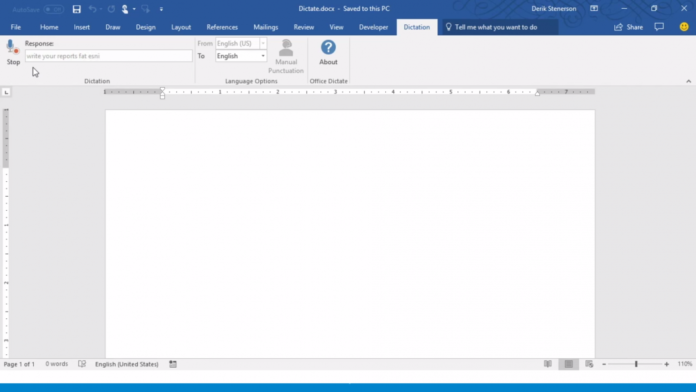 Dictate which is an Office Plugin for Outlook, Word and PowerPoint converts your speech to text since it is powered by state of the art speech recognition and artificial intelligence. The Office Plugin converts voice to text in 20 different languages and supports real time text translation of up to 60 languages. Users also have the option to use words like “New Line” which takes the cursor to the next line, “Delete” which removes the last dictated word and more. The Latest app of the Microsoft Garage Project is available for download and is available for both 32 bit and 64 bit version of Office. However users would need Windows 8.1 or later, Office 2013 or Later to install the app.